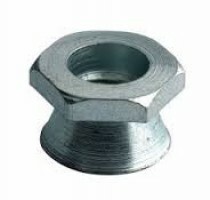 A high security permanent nut fastening. The hexagonal part of the nut shears off at a predetermined torque leaving a tamper resistant cone. No specialist tools required, use standard socket or spanner. Manufactured in bright zinc plated (CR-3) steel, galvanised steel and A2 stainless steel.